SO, last week we woke up to news that the bomb used by the Saudi-led coalition in a devastating attack on a schoolbus in Yemen was sold as part of a US State Department-sanctioned arms deal with Saudi Arabia. The weapon that left 40 children dead on August 9 was a 227kg laser-guided MK 82 bomb made by Lockheed Martin, one of the top US defence contractors. Political Action committees (PACs) are vehicles that are organised for the purpose of raising and spending money to elect and defeat candidates. US defense contractors dominate the list of top 10 contributors (PACs) to Congress. Defence contractors such as Honeywell, Northrop Grumman, Boeing, Raytheon, General Electric and Lockheed Martin are the main players whose ‘big bucks’ fund the campaigns of various politicians who are entrusted by the nation to protect them from the very vampire corporations that are death merchants. The US Government is by far the biggest customer for most US defence contractors, and it is in no way unusual for these companies to spend millions lobbying Congress in any given year (collectively the defence industry spent nearly US$128 million lobbying in 2015). “ In January 1961, US President Dwight D. Eisenhower used his farewell address to warn the nation of what he viewed as one of its greatest threats — the military-industrial complex composed of military contractors and lobbyists perpetuating war. The speech may have been President Eisenhower’s most courageous and prophetic moment. Fifty years and some later, Americans find themselves in what seems like perpetual war. Professor Turley notes that there is mounting evidence that the ordinary folk are not interested in the wars that the US is waging across the globe. It is the regular man on the street whose children are returning home in coffins with a callous commander-in-chief who treats the deceased as part of ‘the cost of war’. Polls show that Americans are not interested in the US’ continued wars abroad and yet the military-industrial complex continues to easily muster the necessary support from both Democrats and Republicans in Congress. It is a testament to the influence of this alliance that hundreds of billions have been spent in Afghanistan, Iraq, Yemen and other far off places while Congress is planning to cut billions from core social programmes, including a possible rollback on Medicare due to lack of money. The recent death of 40 children ‘courtesy’ of Lockheed Martin’s laser-guided bomb is nothing new. For years, the US has been killing innocent civilians using faulty weapons that US ‘allies’ are supplied by the military industrial complex. A bomb that is very similar to the one on August 9 wreaked devastation in an attack on a funeral hall in Yemen in October 2016 in which 155 people were killed and hundreds more wounded. In March of that year, a strike on Yemen by a US-supplied precision-guided MK 84 bomb killed 97 people. In the aftermath of the funeral hall attack, former US President Barack Obama banned the sale of precision-guided military technology to Saudi Arabia over ‘human rights concerns’. On December 17 2009, the US military launched Tomahawk cruise missiles from a ship off the Yemeni coast on a Bedouin camp in the southern village of al-Majalah in Yemen, killing 14 alleged Al-Qaeda fighters and 41 civilians in the Arabian Peninsula. Initially, both the US and Yemeni governments denied the former’s involvement in the strikes, despite accusations from Amnesty International. Several months after the attack in Al Majalah, Amnesty International released photos showing an American cluster bomb and a propulsion unit from a Tomahawk cruise missile. 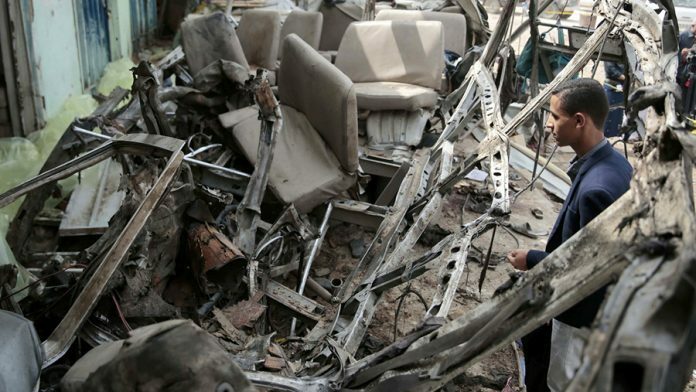 A subsequent inquiry by the Yemeni Parliament found that among the 41 civilians were 23 children. 75 percent success rate was higher than those achieved during the Kosovo and Gulf wars. Pity the poor souls who got caught up and killed or maimed by all the bombs and missiles that did not hit their targets! A few months ago, a test of the anti-missile missiles yet again proved that the snake oil salesmen who manufacture these weapons of death are selling duds, as the test failed yet again. A US defence official informed the media in June this year that in the latest test, both the ballistic missile and the SM-3 interceptor missile fired from the American warship landed in the ocean, but neither were recovered after both missiles broke up on impact. These so-called ‘smart and expensive weapons’ are killing innocent men, women and children who have no stake in the wars America is fighting abroad. It is not the children of politicians that are dying on either side. President Trump’s sons are more likely to die in a hunting accident than they are to meet their demise at the war front. If these missiles were some defective toys or vehicle, they would have been recalled. The US used 59 missiles in its attack on the Shayrat Air Base in Homs Province in Syria in April 2017 — 59 missiles in about 30 minutes. These missiles have been used since the Gulf War, in Sudan, Afghanistan, Yemen and Libya. Wars are serious business and anyone who believes that America is waging all these wars in pursuit of democracy, justice and world peace needs his/her head examined. Peace and freedom do not come through the deaths of innocent women and children!